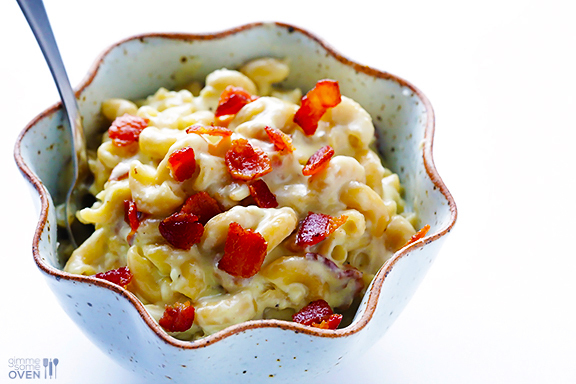 This blue cheese bacon macaroni and cheese recipe is going to knock your socks off. Plus it can be made in about 30 minutes! Heat bacon in a skillet over medium-high heat for about 5-7 minutes, stirring frequently, until crispy. In a separate bowl, whisk together evaporated milk, egg, salt, pepper and cayenne until combined. Set aside. Meanwhile, bring a large pot of salted water to a boil, and cook the pasta al dente according to package instructions. When the pasta is cooked, drain it and then return it to the pot and reduce heat to medium-low. Immediately add the butter, and toss until the butter is melted. Pour in the evaporated milk mixture and stir until combined. Continue cooking over medium-high heat, stirring occasionally, for about 3-5 minutes, or until the sauce comes to a simmer. Remove pan from heat and add in the cheeses. Stir until melted, then stir in the cooked bacon. Serve immediately, garnished with extra bacon and blue cheese if desired.